NOTE: This article was written in December of 2013 while we were renting a private house in Magallanes de San Ramon. On January 1, 2017, we moved to an apartment in town where our hot water was heated by electricity instead of propane gas. Additionally, electricity prices have changed over time. To check the current prices, please see the Related Articles section below and click on the link for the current electricity fees as listed by the National Power and Light Company (CNFL). 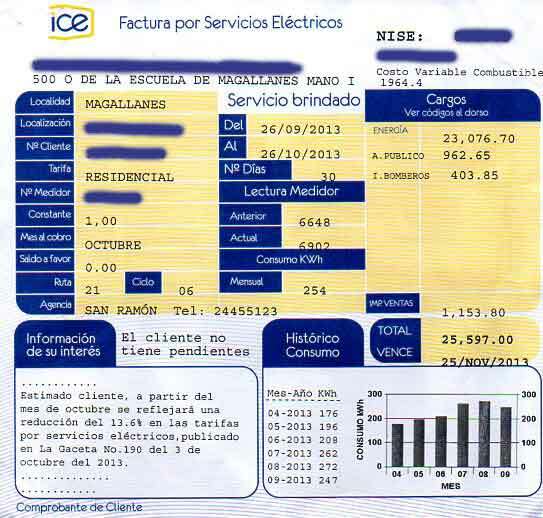 As you can see from our most recent electric bill, we paid ¢25,597 colones (about $51.60 USD) for electricity for the period of September 26th to October 26th, 2013 (30 days). This was one of the rainiest periods of this year’s rainy season. When you look closer at the graph on our ICE bill, you will see that, in both April and May, we used under 200 kilowatt-hours (kWh) per month, and during the months of the rainy season (June through October), we used over 200 kWh per month. Our electricity bill has been as low as $26 and as high as $62 (August 2013). One thing I want to be sure to mention is that we use propane for both cooking and hot water. That’s a big reason our electricity bill is lower than some of our neighbors who have electric hot water heaters and/or stoves. But, of course, that means that we have the added expense of propane, which costs us about $21/month. If we used gas for just cooking and not hot water, propane for cooking would cost us about $7 per month. 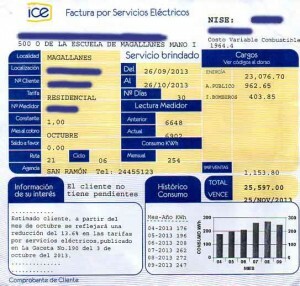 In researching this article at ICE, we learned that the price break for residential electric usage is at 200 kWh per month. The first 200 kWh per month are charged at a rate of 76 colones per kWh. Any usage over 200 kWh per month is charged at a rate of 137 colones per kWh, plus taxes. By using less than 200 kWh, you not only save per kWh, you also don’t pay taxes which are waived. For us, this is a savings of about $3. 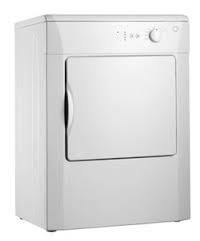 In the past, we have tried to do what we can to minimize our electricity expenses by running our clothes washer early in the morning or after dinner, and being even more conscientious about when we would run the dryer, only doing so when we were sure it was a off-peak hour. But after speaking with two different ICE representatives, we have learned that the time of day you use energy has no bearing on the cost unless you have a “smart meter.” Unfortunately, they are not available in most residential areas and are primarily used by businesses. 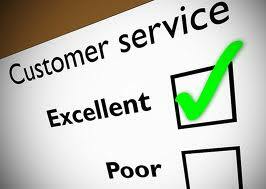 But, where you live can impact your bill significantly, as different areas are charged different rates. We are lucky to live in an area that seems to have a fairly low rate per kWh. I guess the lesson here is to try to use less than 200 kWh/month. How can you keep your kWh usage under 200? It’s simple. Use clothes dryers, air conditioners, and dehumidifiers as little as possible. The main reason our electricity bill goes up in the rainy season is that we use the clothes dryer when doing laundry instead of trying to hang clothes outside on the line. Since I’m the low-tech guy, I do many household chores like the laundry. It’s my responsibility to use the dryer as little as possible. Besides, hanging the clothes from December on is kind of a Zen thing that I really enjoy. Another of my rainy season habits also adds to our electric bill – we run our ceiling fans much of the time to keep the air circulating and mildew at bay. But, because we chose to live at a higher elevation (about 3,000 ft.), we never need air conditioning. Plus, we always wanted to live with our windows and doors open as much as possible, so dehumidifiers and air conditioners were out of the question for us. Another tip, especially if you own your house, is to be sure that the electricity is properly grounded. We know folks whose house was built with the current improperly grounded, so much of the energy usage was wasted and their bill was higher than it needed to be. Generally, I pay my electricity bill without challenging it. But because of preparing this money-saving tip, I took a hard look at the current bill and I noticed that the costs were not adding up. The bill appeared to be 470 colones off, a little less than $1. I already paid the bill a few days ago, in person, as we pay all of our bills, even though we could pay most of them online. It gets us out there in the community, interacting with people and using our Spanish. So, I did what we all do. I called our local customer service number (which is printed on the face of the bill) and spoke with a wonderful representative, very patient and kind, I thought. When I told her it was only a 470 colones discrepancy, she said, “It may be a small amount, but you want to know the reason, right? She said she’ll call the main ICE office in San Jose and get back to me later in the day or tomorrow. Interestingly, I did it all in Spanish, successfully no less. It was like getting a free Spanish lesson. Early on, I told the representative that my Spanish was so-so, especially on the telephone. She told me, “Don’t worry, we’ll get through it together.” How’s that for customer service? This is just one more impromptu interaction that keeps the adventure going for Gloria and me. We may have been here five years, but it’s a good example of why things are still new to us, and it happens almost every day. Here’s some good news for all ICE customers. All customers are receiving a 13.6% reduction of their charges for the months of October, November, and December, 2013, due to a previous overcharge.